Perhaps no creature that has been proven to exist today appears more alike the ancient dinosaurs than the large monitor lizards. It would be expected that long-lived monitor lizards attained even greater size under the optimal conditions of the early earth. In fact, the skeleton of a 20 foot giant monitor lizard, Megalania, has been discovered in Australia. It probably weighed about two tons and may have hunted giant kangaroos! In 1910 Lieutenant Steyn van Hensbroek of the Dutch colonial administration heard stories about a “living dinosaur” in Indonesia. Ridicule gave way to amazement as the Komodo Dragon was discovered. These dragons can grow up to 3 m (10 ft) and may weigh 136 kg (300 lb). 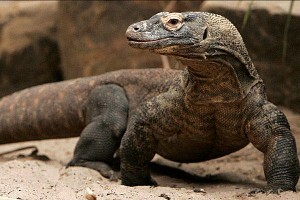 This, the biggest of known lizards, lives exclusively in Indonesia, mainly on Komodo island. 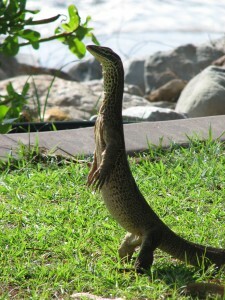 Like other members of the monitor lizard family, they are carnivorous, feeding on animals as large as a deer or a pig. They can be fierce if cornered. Often the baby Komodo Dragons climb trees like an iguana. The large adults will burrow or pass the hot daytime under bushes, coming out in the morning and evening. Like several other monitors, Komodo Dragons swim well, sometimes swimming to small islands where they are a threat to domestic livestock. In 2009 it was discovered that the dragons were venomous. Their bite doesn’t just introduce bacteria into their prey, but they deliver a venom that stops blood clotting and induces low blood pressure to immobilize their victims! In some ways giant modern lizards help us understand how the great reptiles, like the dinosaur Thecodontosaurus, may have lived. There are dozens of species of monitor lizards found in Africa, Asia, Indonesia, New Guinea, and Australia. Indian Monitors are thought to have been transported by natives to the Polynesian Islands, possibly as a food source. Monitors have a unique ability to greatly increase the size of the mouth cavity enabling them to swallow their prey whole. The Nile Monitor (right), the largest lizard in Africa, sports a distinctive blue tongue and has been observed to grow as long as 8 ft. It will lay eggs in termite mounds which provide a natural incubation! The Earless Monitor is a semi aquatic lizard that is native to Borneo. These lizards (along with some other reptiles) continue growing their entire life. For ten years field researchers scoured the rainforests of the northern Philippines trying to confirm reports of a reclusive monitor lizard living there. Tribal reports of the “Butikaw” and claw marks on trees were all that was officially known. But in 2009 the six foot long lizard (left) was finally found, photographed and eventually classified as a new species: Varanus bitatawa. The beautiful, yellow-colored monitor lizard’s known range is currently limited to the Sierra Madre Forest, in the northeastern coast of the island of Luzon, Philippines. If a huge monitor lizard could go undiscovered for so many years on a heavily populated island like Luzon, it should not be deemed unreasonable that pterosaurs could still persist on remote islands in Papua New Guinea.